How to Shop for Man Cave Decor When Designing Your Manly Space - Man Cave Details: Man Cave Ideas, Decor, Signs, Furniture and More! Every man wants some lone time with buddies pursuing favorite hobbies and pastimes. 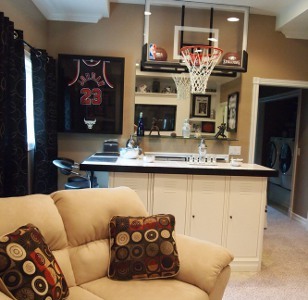 A man cave at home offers a great alternative to night clubs and gaming parlors. In fact, a 2013 survey reveals that more than half of American homes have a specifically-designed man space. Numbers from UK indicate that men spend an average of 7 hours and 36 minutes each week in their caves. Eight out of ten men believe that their relationships have improved after this lone time, and six out of ten women agree with them. Man caves allow you to have fun from the comfort and privacy of your home. Modern man cave decor goes beyond television sets and recliners. They are functional areas that are used to pursue hobbies and display unique collections. Men are coming up with creative ideas to furnish and decorate their personal spaces. The decor of a man cave will depend on many factors and the number of man cave ideas. Every design should, however, focus on some essential features. Comfort – You will spend significant amount of time in your manly space. It is a place where you relax and rejuvenate after a tough day or week at work. Your guests also seek convenience. Hence, it is important to choose a comfortable room and decorate it with items that accentuate the area without cluttering it. Style – Your man cave is your private sanctuary. Hence, it should contain items that make you happy. The room should reflect your style. Choose an appropriate theme and go for furniture and accessories that offer a glimpse of your personality and personal preferences. Fun – Man caves are all about having fun. The decor should, therefore, include both functional items and display pieces that help you spend some quality time alone or with a bunch of buddies. Everything from games and bars to home theater systems are appropriate for the area. It is your room, and it is important to do it your way. Apart from space, money is often an important determining factor. However, if you have some extra dollars to splurge, you can create an exotic man cave for yourself, much to the envy of your friends and loved ones. There are hundreds of options that help make your man cave upscale and unique. You can find decor that makes your sanctuary comfortable, stylish and fun. Choose a location on your property that is slightly isolated from the rest of the house. It should offer privacy while allowing easy access to the main part of the house. Finalize the theme. This is often the most important step. The decor of your man cave will directly depend on this. Make a list of all the things you are passionate about. Zero-in on activities that offer hours of fun. You may also opt for items that you can enjoy with your friends but remember that your man cave is ultimately about you. Do not compromise for the sake of others. Design the room and find items to go in it. Many men opt for professional designers. They will learn about your preferences and come up with innovative ideas. They can also arrange for contractors to complete the job for you. Most designers will help procure the items to decorate the room and arrange everything for you. You may be as involved as you want. Create your own design and build the man cave during your downtime for fun. Seek professional help wherever necessary. Collect items for the room from your travels around the world. They could bring back beautiful memories every time you step into the room. No upscale man space is complete without certain items. Whether you love sports, movies, television series, or documentaries; watching it on a high-end television or home theater system will make a big difference. Good speakers will provide the right impact making the shows fun for others as well. Go for cool products like 3D televisions, OLED screens, or LCDs with screen size of more than 85 inches for an unmatchable experience. You may also opt for hidden LCD screens that can roll out whenever you need them. If you hope to spend several hours in your man cave, choose comfortable chairs, sofas, recliners and other pieces of furniture. They should look attractive as well, and match the rest of the man cave decor in your house. Importantly, the furniture in your cave should reflect your personality. You can place them in an organized manner or just leave them around and allow the guests to position them according to their comfort. Appropriate lighting sets the mood of any room. Choose fixtures that create the right atmosphere. Many light manufacturers offer custom pieces that can be designed as per your requirements. You contractor can guide you through the process. The type of decor on the wall will essentially depend on the theme. Begin by choosing the right paint. You can, for example, paint the walls to match the colors of your favorite team. You can also opt for your favorite shades. Decorate the walls with posters, paintings, and memorabilia that work with your theme. No moment of reflection is complete without a good drink. A man cave bar can also add to the fun of your party. Go for shelving that displays all the options. Leave some place for the bartender to try some new tricks. Granite counter tops, exquisite bar stools, beverage dispensers, and high quality mugs and flutes can further elevate the experience. Sitting and chatting in a bar for long hours is not a man’s thing. It is, therefore, important to add some action to your cave. 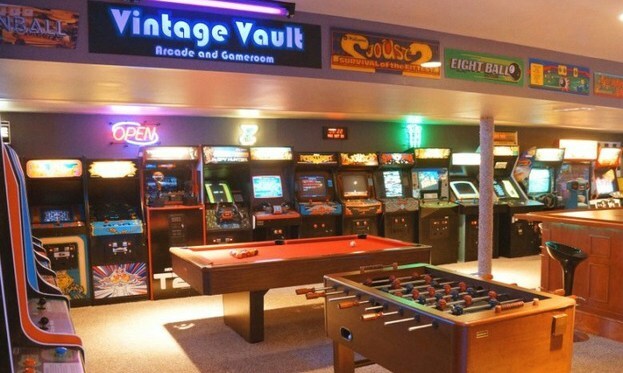 Place a pool table or a few slot machines and convert your man cave into a gaming parlor or a casino. You may have a spa or a swimming pool instead. Other options include basketball courts, tennis courts, gym equipment, and driving ranges. There are hundreds of options. Choose activities that you enjoy. Video games are an essential part of most modern man spaces. Unless you are particular about not having them, go for a quality gaming console. Connect it to your entertainment center for full-blown fun. Maintain a collection of your favorite games. Opt for simulators that allow you to enjoy games with your buddies all through the year. You can also go vintage and fill your space with old style arcade games with favorites like Defender, Donkey Kong and Pac-Man. Place a separate security system in your man cave. This will prevent uninvited guests and trespassers from entering your sanctuary without your permission. You may also go for windows that change from clear to opaque with the press of a button. While the focus should remain on the main room, adding some novel features to the bathrooms and other parts of the space can make for interesting conversations as well. Some high-end brands offer toilets with special control panels that allow you to adjust the flow of the water and the temperature of the seat. 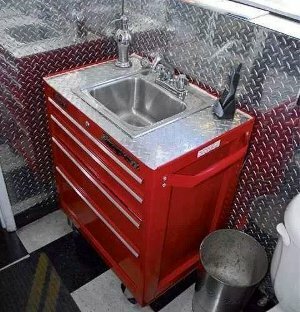 You can also incorporate your man cave theme into the bathroom with a tool chest for a vanity. If you do not have constraints on the budget, the sky is the limit. Use your creativity and imagination to come up with a dream room that you have always wanted. You have a wide choice, and new man cave decor items are being introduced as we speak. Online catalogs offer some novel innovative ideas. You may seek professional help as well. However, remember to add your personal touch to the room and make it your own.